Even though these figures may put things into perspective, you probably don’t need stats like these to point out what most of us already know – we’re all stressed out and overwhelmed in our own way, and we’re paying for it with our health, minds, and hearts. It doesn’t matter whether stress is intense or subtle, it takes a toll on body, mind, mood, energy, performance, and even relationships. If you’ve been feeling constantly overloaded, drained, strained, exhausted, or burnt out, I’m going to show you exactly how you can quickly, easily, and naturally experience relief through the ancient practice of yogic breathing, aka: pranayama. I’m also going to cite modern-day research, which explains how yogic masters had it right thousands of years ago, long before we could track and measure its efficacy. The quality of one’s life depends upon the quality of one’s mind. In our clinical practices, we find that starting with breath practices gives immediate benefits that most people can experience. When these mechanisms grow stronger your stress resilience increases, and you’re are able to face the challenges of life much more effectively and efficiently. What is pranayama yoga breathing? Pranayama is yogic breathwork technology used for thousands of years as an effective tool for self-regulation, and the cultivation of mental, emotional, and physical health. The regular, consistent practice of yogic breathing offers a vehicle through which you can manage your stresses, emotions, thoughts, moods, and energy much more efficiently – without having to resort to anything or anyone on the outside. To practice yoga means to move towards the unification of your mind, emotions, body, and energy. Yogic breathwork helps you create a state of union within yourself first, and then union with your external world. 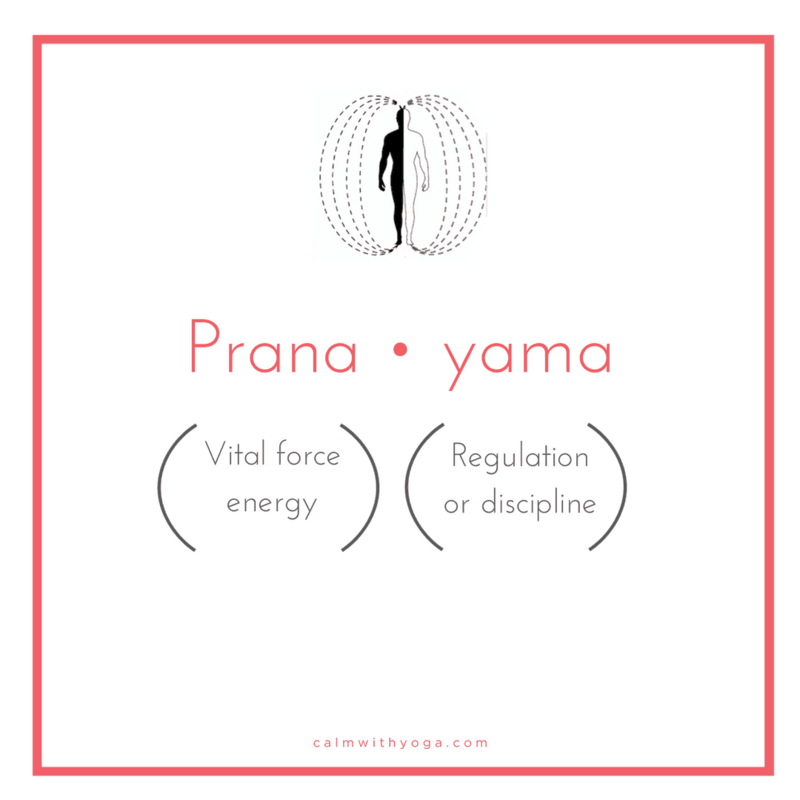 Pranayama is the 4th of the 8 Limbs of Raja Yoga. Raja Yoga, is called ‘Royal Yoga’ because it is considered the highest form of yogic practice. It is referred to as ‘the science of the mind’ or ‘mental yoga,’ and its objective is to achieve mastery over mind, mood, emotions, and energy. Practiced correctly, Raja Yoga can be more powerful for mental and emotional health than many of the more well known tools promoted today. The physical Yoga, or Haṭha Yoga, was primarily designed to facilitate the real practice of Yoga— namely, the understanding and complete mastery over the mind. Traditionally, the word Yoga by itself refers to Rāja Yoga, the mental science. Rhythmic (breathing) patterns strengthen the respiratory system, soothe the nervous system, and reduce cravings. As desires and cravings diminish, the mind is set free and becomes a fit vehicle for concentration. Though the practice of pranayama is ancient, there is now growing evidence that supports its effectiveness as a tool for managing mental, emotional, and physical health. Because of this, pranayama (along with meditation, mindfulness practices, and physical yoga postures) is being increasingly used in protocols in sectors such as veterans, government workers, and natural disaster victims. The way you breathe – whether fast or slow, shallow or deep, long or short – impacts your emotional state and mood. Conversely, different emotions are connected to different corresponding breathing rhythms so your breath ends up matching your emotions and mood. Our breath automatically responds to our emotional shifts. That is, until we learn to consciously control it. In the first study, participants were asked to generate a specific emotional state like anger, fear, sadness, or joy. Philippot studied the breathing patterns that corresponded to each respective emotion and found that there was a match. Each specific emotion had its corresponding unique breathing pattern. These breath-emotion matches proved to be consistently similar across the board among individuals. The second study involved a cohort of new participants. Philippot took the results from Study #1 to see if the specific breathing patterns would have an effect on their corresponding emotional states. The participants did not know the real objective of the study, and were just asked to breathe in specific patterns. The Lord of the senses is the mind, the Lord of the mind is the breath; the master of breath is the nervous system; quietness of the nerves and concentration depend solely on the steady, smooth and rhythmic sound of the inhalation and exhalation. When my GAD (generalized anxiety disorder) was at its most intense and overwhelming, I desperately searched for a cure – any cure to help take away my incessant anguish, heaviness, insomnia, and desperation. It’s normal human behavior to wince and try to remove yourself from the pain, discomfort, uncertainty, and fear that comes along with feeling like a prisoner of your own mind and emotions. If the discomfort reaches a tipping point, we become willing to do anything to make the pain of the experience go away and just stop. If I could, I’d go back in time and caution the me of then to rethink the way I was seeking out a cure for my anxiety. Because I realized I was approaching it from a less optimal angle by having an unrealistic expectation that something outside of me could magically make my anxiety dissipate. It’s not about trying to eradicate and vanquish your anxiety as if it were the enemy, because it’s not, even though I know it can definitely feel and seem that way at times. Instead of wishing it go away or resenting your anxiety, it’s wise to instead learn to live well with it. To dance with it harmoniously. To learn and grow from it. After much resistance and fighting on my part, I realized that my anxiety is a gift, as crazy as that may sound. My anxiety is a gift because it presents me with valuable feedback, that, should I choose to heed, will result in accelerated growth, expansion, transformation, and healing. If I choose to ignore my anxiety’s feedback, promptings, and clues then my growth and transformation are stunted, my energy reserves are depleted. Since what you resist persists, setting up the expectation that your anxiety disappear and never appear again is often times an inefficient use of your mental, emotional, and physical energy. Instead, look to find the benefits, lessons, and specific growth that has come as a result of your experiencing it. There are always benefits though it may be hard to see them at first. And sometimes, to reap the benefits we must walk through the fire and experience some level of pain and discomfort first. For example, as a result of my anxiety, I sought out natural ways to shift coping mechanisms that weren’t serving me. I used to use food and alcohol as a way to distract myself, numb my angst, and overcome regular insomnia. Realizing how much these habits were compromising my mental, emotional, and physical health (not to mention making me look older, puffier, and more bloated), I set out on a quest to find better ways and more effective solutions. This is how I discovered the power of Raja Yoga, mindfulness, and functional nutrition. Had it not been for my anxiety, I would have never completed yoga and meditation teacher training, and I most certainly wouldn’t have gotten certified in functional nutrition either. If I hadn’t completed those trainings, I wouldn’t have discovered my love for researching and writing in the fields of natural mental and emotional healing methods. And I definitely wouldn’t wouldn’t be writing to you right now. I owe all of these things that now form such a huge part of who I am and my life’s mission to my anxiety. Your anxiety is presenting you with meaningful lessons and opportunities to transform your life right now. If you wish it away, you’re wishing these opportunities and gifts away too. Learning to be with your anxiety (and not run away from it); learning how to live with it as a feedback mechanism of your daily life is really what we’re after here. While you can’t always control what happens in the outside environment, you can definitely control your inside world. It’s up to you to take the necessary steps to manage and regulate yourself efficiently and focus on what is in your control. It can be the difference between an uninspired, reactive life, and an inspired, proactive life. Adopting a regular pranayama practice is a great start and a powerful gift you can give yourself. With just this one simple (but consistent) act, you’re setting yourself up to win, without the need of anything other than your own breath, and mindful awareness. Your breath and your mindful awareness have the power to calm your nerves and soothe your nervous system. Controlled breathing can activate mechanisms in your body that regulate your rest/ digest/ relaxation/ regeneration response, all while decreasing your stress response. The following are 2 simple and effective pranayama exercises for you to begin a regular practice with. I’ve kept this protocol as simple as possible in order to make it as easy as possible for you implement these exercises into your everyday routine. Remember: You have to put in the work in order to reap the benefits of this powerful practice. Consistency and persistence is key; benefits do not happen overnight or in an hour. The best way to create habits that stick is to start off small and make sure you can commit to something realistically doable. The point of this practice is to make it a part of your daily life. I find that doing it first thing when waking, and last thing before sleeping makes a big difference. Just 5 minutes when you wake up in the morning can set the tone for your entire day and help increase your resilience to whatever stresses the day brings. Another 5 minutes before going to bed in the evening can help calm your body and mind, and improve the quality of your sleep. Seriously, these 10 daily minutes can be the best gift you give to yourself, and it won’t cost you an extra cent. Both of these exercises can be done virtually anytime, almost anywhere. You can practice these when you’re stuck in traffic, doing the dishes, folding laundry, cooking, or just walking in the park. These tools are your best ally when an anxious moment arises or when you feel you’re going to lose it. You can practice them sitting, walking, or lying down. With your eyes open or closed. However feels right, as long as you practice. Optimal breathing is belly breathing. Be mindful to engage your abdomen when practicing these exercises. This means your lower belly should be expanding outwardly when you inhale, and it should be contracting back into your spine when you exhale. Your chest, neck, and shoulders shouldn’t be moving. As the name suggests Sama Vritti involves breathing in equal parts or for the same number of counts during each step of the exercise. This exercise is so effective in soothing the nervous system and calming anxiety during high stress situations that it is widely used by Navy SEALS, first responders, soldiers, police officers, firefighters, and athletes. *Remember to breathe through your nose and engage your lower belly. During Ujjayi you gently constrict the back of your throat, which results in the breath sounding like ocean waves or a subtle hiss. Sustaining focus on the sound of your breath while practicing Ujjayi will make it easier to concentrate and silence the mind’s chatter. *Remember to breathe through your nose, engage your lower belly, and tighten the back of your throat as you breathe to produce the ocean sound. According to the Yoga Sutras, a veil of mental darkness covers the light within. The benefit of pranayama is that it removes this veil, and the mind becomes clear and fit for concentration. While pranayama helps improve physical health and well-being, that is a secondary benefit; the main benefit is control of the waves of the mind through regulation of the prana. Since breath and emotions dance with one another, you can learn to use one to influence the other. The moments when you’re most stressed, anxious, angry, afraid, overworked, and overwhelmed are precisely the moments when you most need to bring awareness and consciousness to the breath. These are the moments where you can take back control by taking back your breath. The next time you find yourself experiencing any heightened emotion like anxiety, see if you can catch yourself in the moment and pay attention to the breathing patterns that come along with it. Developing the skill of breath awareness during emotionally heightened times is just as important (or perhaps even more important) than learning the exercises themselves. If you can rise above the reaction and realize in the moment it’s happening: “Ok, I’m feeling…” anxious/ angry/ scared/ frustrated/ overwhelmed… you’ve already won half the battle. The second half is won by training yourself to use these exercises in the hot moment. Personally, yogic breathing has been one of the most powerful tools that has helped me manage my anxiety naturally and without the use of meds. Realizing that my breath can be my enemy or my ally was the turning point that led me to consciously choose to take control of it, instead of it controlling me. We all have that choice to make. With each and every breath we all get to decide who’s in control. On average you’ll take 16 breaths per minute. That’s 16 opportunities to decide each minute. There are 1,440 minutes each day. Today alone you’ll have 23,040 opportunities. (5) Satchidananda, Swami. The Yoga Sutras of Patanjali: Commentary on the Raja Yoga Sutras by Sri Swami Satchidananda. Integral Yoga Publications.